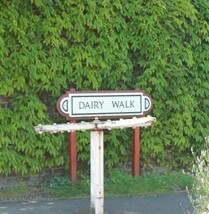 In the Wimbledon Way leaflet the “lane” described as Dairy Walk (12 on the Stage 2 map) was simply a footpath and was known as Dairymaids Walk, although it is now listed on local maps as you say. A probable reason for it being so known is that the lower echelons of servants in most, if not all better-off families, such as may have farmed in the area, were obliged to travel on foot, while the Owner and essential staff in earlier times were conveyed in or on some form of wheeled transport such as a horse-drawn carriage, or dogcart and later by car, to and from St. Mary’s Church. I knew the path well as a six year-old, over eighty years ago now, walking from and to Queensmere pond and my apartment home in Gap Road, one of I think seven large Victorian mansions, later either bomb-damaged or destroyed and eventually bull-dozed and replaced with Council flats. I well remember also the view across to the golfers, the lake and to the then fairly recent Wimbledon Tennis grounds and to the District Line trains making their noisy way up to the West End and beyond. Our family still occasionally enjoy a walk in Wimbledon Park and marvel in the way it has been developed, improved and enhanced. We think ourselves so very fortunate to have such a legacy of care provided by all those, sponsors and others, who have contributed to its construction and maintenance. Many thanks.